Yesterday, after finishing two of my five exams, I joined a big group of friends in search of a long lunch somewhere across the bridge. After being cooped up in my room for 4.5 hours with a laptop and a timer ticking away, I was happy to go anywhere, but was even happier to check out Russell House Tavern, the new restaurant in Harvard Square. Located on a busy section of JFK Street, its easy to miss this place, especially if you’re used to ignoring the Finagle-a-Bagel that formerly occupied this building. The restaurant is actually rather large and when you step inside you’re greeted with a modern but tasteful ambience and a casual, quick fix feel. Bar stools and high tables dominate the floor, with lower, more intimate-looking tables set against the walls. If you venture to the back, a large staircase leads down into a cave-like expanse of richer-looking tables, a more old-world ambience and a hostess ready to seat you. This is clearly the real restaurant. The upstairs lunch area reminds me a little of Pizza Express, Ping Pong and other higher-end chains in England, while the downstairs is more brasserie-meets-gastropub. We ordered burgers, crab cakes and an assortment of lunch time sandwiches. The grilled cheese was melt-in-the-mouth delicious and the fries were satisfyingly crunchy. The Tavern Buttermilk salad however, turned out to be a huge letdown, with an egregious ratio of romaine and almonds to grapes and fennel and a painful lack of Benton ham. Our waiter was friendly, prompt and helpful with recommendations and the food itself was quick to appear. 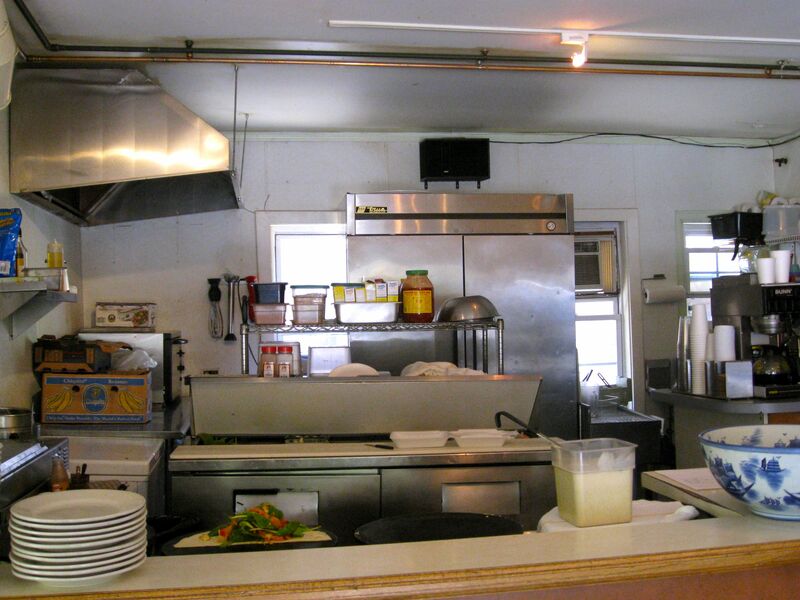 The Verdict: Expecting it to clean up the competition…..Great choice for lunch, large enough to accommodate big groups, can’t wait to check it out for dinner and try the famous Chip-in Farm Egg! New York v Boston or Boston v Cambridge? Every so often, when I’m in New York, someone will ask me “how do you like Boston?”. And, every so often, I will hesitate before pulling out my stock answer “it’s fine, you know, its a great student town, but really, it’s nothing like New York.” The reason behind my hesitation is that Boston is actually a great town…err city. It’s clean, it’s incredibly pretty (when not covered with snow and freezing rain), it’s safe and importantly, it’s within easy reach of some wonderful weekend road trips. Despite these and many more merits, Boston’s failure to deliver on the restaurant front has unfortunately landed it squarely in my “nothing like NY” bucket. I just got back from the Cellar, a cute but inconspicuous little place on Mass Av that rightly lives up to its unpretentious name. Much like a Nottinghill gastropub, the Cellar is split into a downstairs bar and a more upscale upstairs restaurant (“Garden at the Cellar”). Neither place takes reservations and the space is small, so you’d do well to get there before 9pm on a weeknight and before 7pm (I’ve been told) on a weekend. Eyeing the line at the restaurant, we decided to head downstairs and quickly found seats at the bar. There’s no waitstaff downstairs and the menu is slightly shorter, but our bartender was very friendly and told us we could order from either place. A quick look at the deliciously-worded list and we decided to order tapas style, choosing a few small plates to share. Our food arrived quickly and was absolutely divine. The Pancetta Wrapped Dates with Goat Cheese and Apple Hash were scrumptiously juicy and bursting with flavour. The Chicken & Thyme Croquettes were crisp, grease-free and perfectly spiced. The Homemade Tater Tots were surprisingly delicate and the Mini Burgers on Brioche with Crispy Potatoes were melt-in-the-mouth delicious. Yum! To top it all off, our bill was less than $15 per person – absolutely incredible when you consider the rip off prices we usually end up paying for dinner. Are you listening Boston? The Ambience: Dim-lighting, lively vibe, background music at perfect pitch. Crowd is mostly older students and young professionals. Perfect for small groups, drinks and dates. Author Wandering TashPosted on April 14, 2010 August 27, 2014 Categories Boston Restaurants, FoodTags bacon wrapped dates, Cambridge, croquettes, sliders, small plates, the cellar1 Comment on New York v Boston or Boston v Cambridge? …Especially when you’ve braved a torrential downpour to get to them. Class ended at 11.40am today and despite the fact that I had a team assignment to work on, an interview call at 2pm, a two hour Spanish class to attend, three cases to read and a date with the gym pending, I decided to follow my two favourite girls across the bridge in search of crepes. It had been raining buckets all night and the wind was howling louder than ever, but nothing could shake our steely will (and resolute stomachs). We snubbed the dining hall suggestions of our well-intentioned class mates and, raising our (two) umbrellas high, stepped outside. By the time we got to the Creperie, we were soaked to the skin and absolutely freezing. But oh what a feeling it was to walk into that charming, old-fashioned cafe and be greeted by the warm smell of sizzling butter and sweet sweet sugar. The Arrow Street Creperie is tiny and adorable with a few small tables and wrought iron chairs. We found a larger spot with a bench and stepped up to the counter to order. 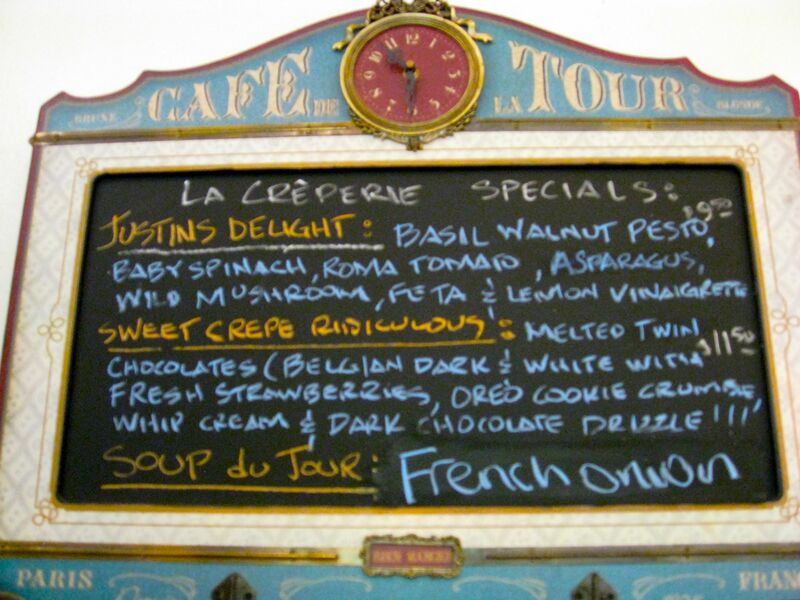 On the advice of my friends, I decided to try the St Martin Justin’s Delight – a savory crepe on the daily specials menu stuffed with walnut pesto, pungent gruyere, sauteed mushrooms and other goodies. Absolutely divine. 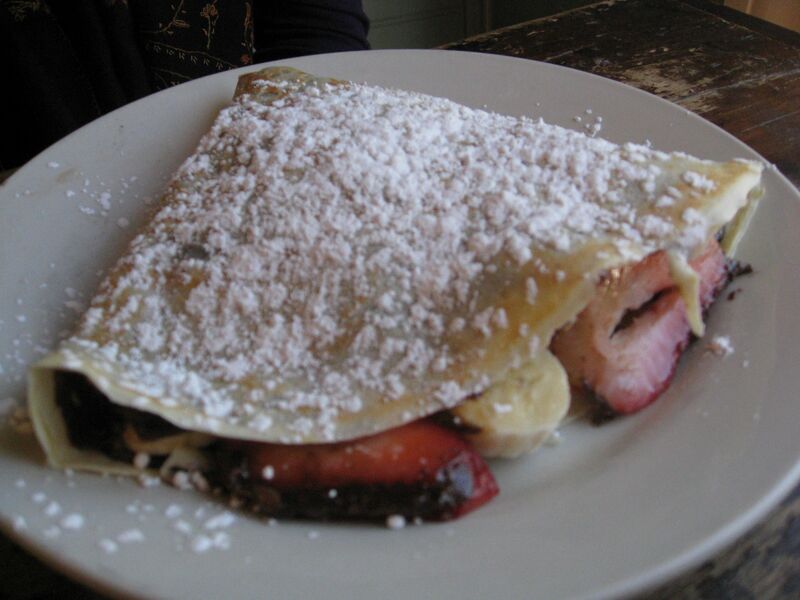 The crepe itself was thin and crisp, the filling gooey and flavorful. The combination worked well, with the ingredients retaining their integrity in a complementary but un-confusing way. The friendly crepe man behind the counter laughed knowingly when I asked for tabasco and instead poured a smidgen of home-made hot sauce into a ramekin and handed it to me. My friends at the table were enthusiastically tucking into the Standard (smoked ham, baby spinach, two eggs, mozzarella) and the Biarritz (fresh asparagus, smoked ham, swiss and roquefort) but the menu near the counter listed a number of more traditional crepes as well. In fact, the Creperie offers a good mix of fun, creative fillings, traditional sweet crepes as well as hot drinks and smoothies. Definitely a great option for breakfast through dessert. 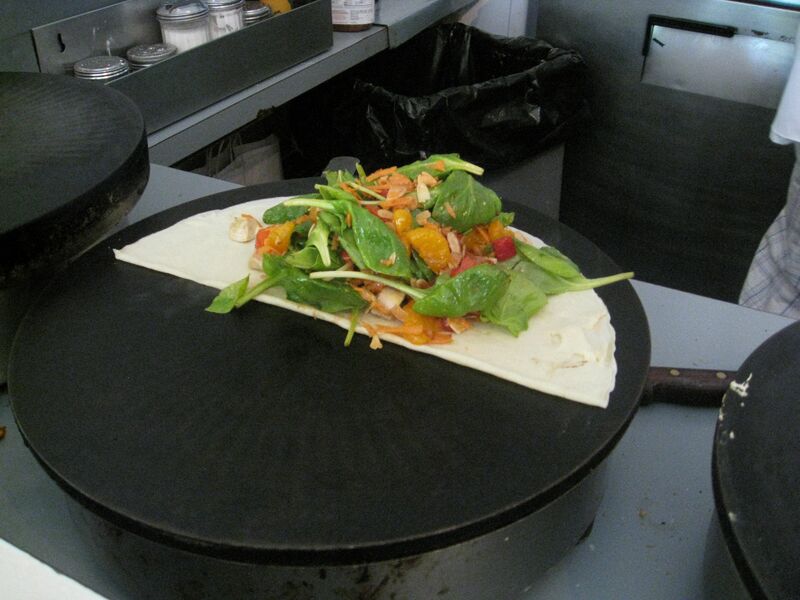 At $8.99, my crepe was probably expensive for what it was, but I personally thought it was the perfect lunch. We inhaled our food in sync and, at 12.45pm, picked ourselves up, donned our rain gear and stepped back out into the storm. So its been a week (a great week actually) since school re-started and, as much I love the convenience of being able to run home to take naps / collect forgotten notes / make phone calls, I am strongly considering moving off campus. Several of my closest friends live across the “Pond” (Charles River) in Cambridge, in cute neighbourhoods adjoining Harvard Square and the appeal of a sub $1000 rent, a large kitchen and perhaps most importantly, a connection to the real food world, is starting to chip away at my moving inertia. This Thursday after class, I was led across the bridge by two hardened off-campusers. 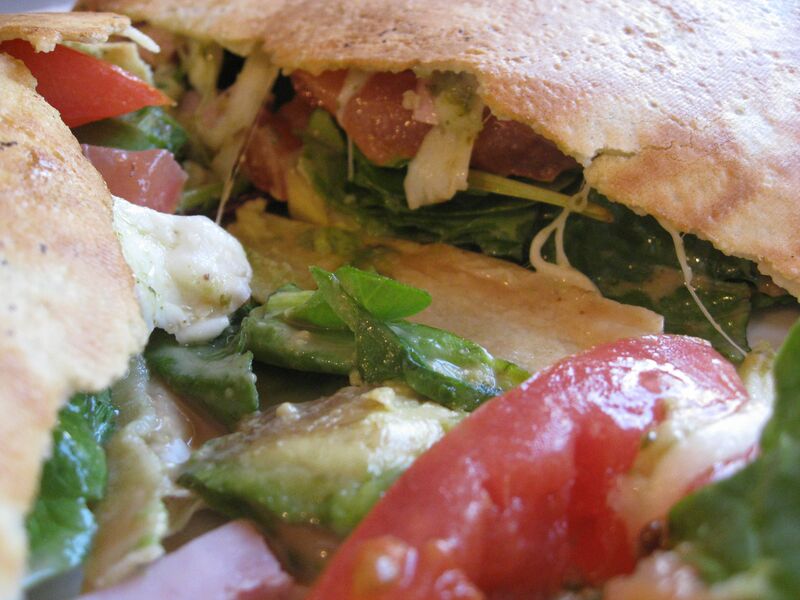 After much debate about Indian buffet and Greek salad, we decided to head to Crema Cafe, an adorable little place on Brattle street, dearly-loved for its fresh sandwiches and mouthwatering deserts. 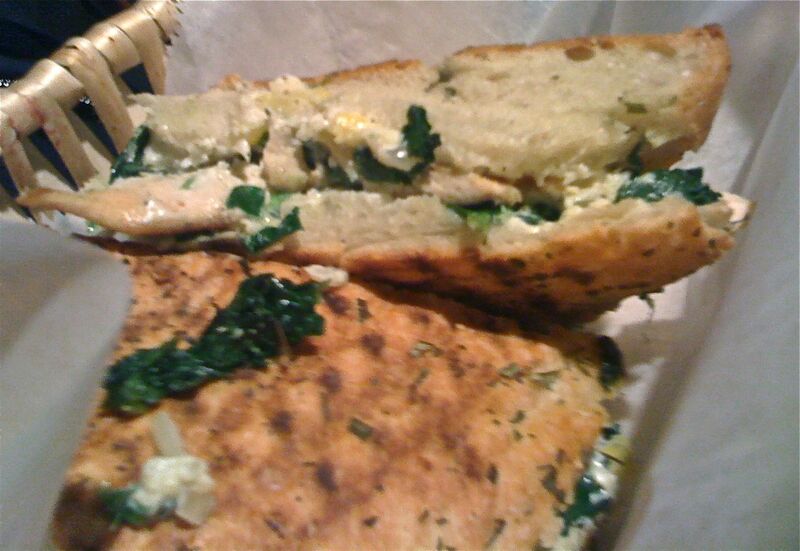 As I tucked into my perfectly grilled crema chicken, I realized how happy I was. I leaned back in my chair, momentarily zoning out in order to soak up the happy sounds of clattering dishes, lazy conversation and Regina Spektor singing about a statue. Moving to a smaller table, we decided to stick around and get started on the next day’s homework. I downed a cappuccino and breezed through the first case. Working off-campus was easy! Moving off-campus should be easy too…hmm. Recognizing that my productivity is significantly boosted by mildly frenetic environments, I decided, on Saturday, to head to another fantastic cafe, Dado Tea for lunch and some more work. I ordered the Cran Apple Salad and a chai latte and sat down with my friend, to wait. The food arrived within ten minutes and was absolutely delicious. The salad was huge and succeeded in balancing the (often tricky) ratio of feta, cranberries, apple and grilled chicken. The latte was foamy and unsweetened, the temperature was perfect. Dado Tea is busy on Saturday afternoons and tends to be dominated by laptop toting grad students who’ve perfected the fine art of pacing their bubble tea sippage with wifi consumption. The place still gets its fair share of tourists and townies though, seduced no doubt by the tempting array of Dado’s desserts and hot drinks. Today was my first day back at the big H post Spring Break. I thought it would be a rough shock to my body. I was right. Waking up for 840am classes is never pretty for a night owl like myself. As I chugged a freshly brewed coffee (my first one in a week) I realized though, that I am happy to be back. Time away has left me refreshed, reinvigorated and perhaps, most importantly, re-employed (for the summer at least). Besides, seeing my friends and classmates after a week of separation has turned out to be a surprisingly emotional reunion! Emboldened by this new found exuberance, my friend Ram and I decided to venture into Boston for some restaurant week fine dining action. Ram was very strategic in sending me an Open Table link with the details of participating restaurants. You see, outsourcing and delegating is a fundamental skill taught at HBS and Mr Lokan knows full well that the foodie in me would diligence every restaurant on the page to shortlist our top 10 choices. 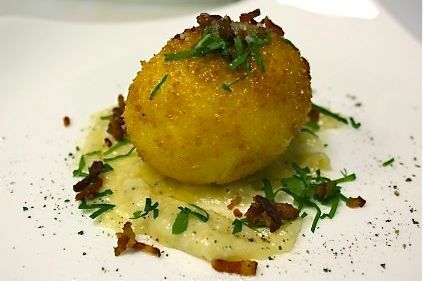 Having experienced restaurant week in NYC last year (which ended up turning into restaurant “month”), I was thrilled to discover that some amazing-sounding restaurants were offering three course meals for less than $35. I settled on Meritage, which 95 Yelpers have awarded an average of 4.5 stars, and booked a table for six at 830pm. The Meritage is located on the second floor of the sumptuous Boston Harbor Hotel but, unfortunately for us, it was too dark to indulge in the supposedly breathtaking views. The first things I liked were the prompt and professional service and the classy bar at the entrance. It is a large and grown-up space, with mostly older patrons (but then that’s Boston) and a modern, minimalist decor. The restaurant week menu is fabulous and is perfectly complemented by a three course wine pairing for only $17. I ordered the Salmon and Avocado Creme Fraiche Tower to start but was first presented with an amuse bouche soup and a few rolls of warm bread. Delicious. My appetizer arrived on a beautifully decorated plate and was surprisingly filling despite its small size. A few bites into my Diver Scallops, I was really feeling quite sated but happy to continue sipping on the Rhone Valley white pairing. We ordered all four plates for dessert but my favourites by far were the chocolate and the red fruit tasters. The Damage: $0 as the two alpha males of the group decided to surreptitiously pay for the entire thing. The Verdict: Meritage you are delicious. You’re older and a little out of my league but anything goes during restaurant week and I shall definitely be seeing you again.